Mandalas, circular patterns of shapes and colors, are complex, beautiful, and meditative. 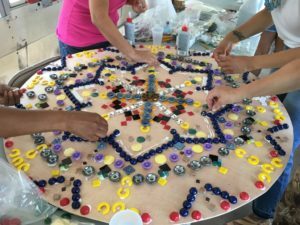 Connection Lab worked with the Guidance Center of Riverside Community Care to support a community of women who are survivors of trauma to make a large collaborative mandala using materials from the Beautiful Stuff Project. Each session begin with a short meditation led by staff of the Guidance Center. 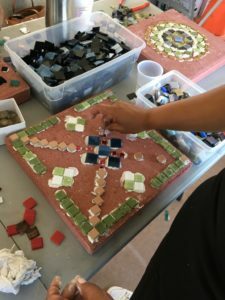 After creating a mandala together, each woman also made a mosaic garden paver with a mandala design. 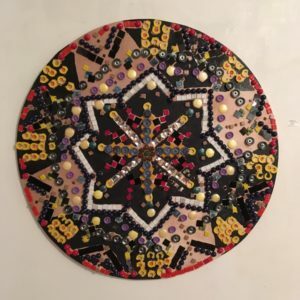 The large mandala was shown at the Cambridge Domestic Violence vigil and at a gallery show called Wall 2 Wall: Art Builds Communtiy. 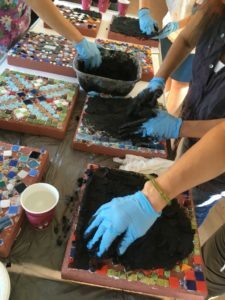 The pavers were taken by the participants to place in their own gardens or somewhere in the city as reminders of beauty and resilience.